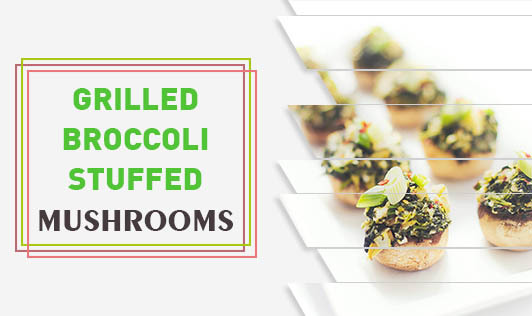 This delish recipe uses the healthiest combo possible- mushrooms and broccoli. Mushrooms are easy to grill and the cheesy broccoli filling enhances the subtle flavor of mushrooms. This simple, easy to make recipe makes a healthy alternative to the calorie-laden pizzas. Heat a teaspoon of butter in a nonstick pan and add onion, garlic, and green chili. Sauté for 2 to 3 minutes. Add the chopped tomatoes and cook for 4 to 5 minutes or until oil begins to separate from the tomatoes. Add the broccoli florets and salt and sauté on a medium flame until the broccoli softens. Cautiously remove the mushrooms stalks and separate the heads. Use the stalks to make a sauce or stock. Carefully hollow out each mushroom head and grease each with a little melted butter. Stuff the mushrooms with the broccoli mixture. Top them up with cheese. Grill them on a non stick grilling pan, till the cheese is melted. Serve hot along with the ketchup.